We’ve lived in our home for a little over two years now and have given it a complete remodel from top to bottom. We removed, replaced and refinished flooring, removed wallpaper and painted the entire interior of the house. We totally gutted our kitchen and master bath. We’ve completed all of the major work and I’m now going through the house, room by room, to put the finishing touches on. Naturally, there have a bajillion diy projects along the way. Today I want to share the top five that I think have had the most dramatic impact. They’re in no particular order. To read more about the project, just click on the title above the image. Project #1: Building a sofa table for behind our sofa. If you saw the Family Room Tour, you may remember me explaining how our sofa is tucked up under an overhang from the upstairs. When the sofa was completely against the wall, it felt too far away from everything else in the room and wasn’t cozy at all. Adding a sofa table brought the sofa out into the room just enough so that now I don’t feel like I’m sitting in nowhereville. Project #2: Adding rustic shelves to the breakfast area. I started out with a gallery wall above the sideboard in my breakfast area, but it never quite cut it. No matter how I tweaked it, I just couldn’t get it to look right. The shelves were an easy and relatively inexpensive project to do that now gives me the perfect spot for displaying favorite pieces and for decorating for the different seasons and holidays. Project #3: Painting the chairs, table and sideboard in our dining room. This was a huge one for me. Not because it was hard, but because I literally agonized over the decision to paint or not for a looong time. I knew that once it was done, it was done and there was no going back and no buying new furniture. Hands down, it was the best “risk” I ever took! I don’t think that my dining room makeover would have turned out nearly as well had I not painted the furniture. Project #4: Painting the brick, trim and fireplace surround of our fireplace. 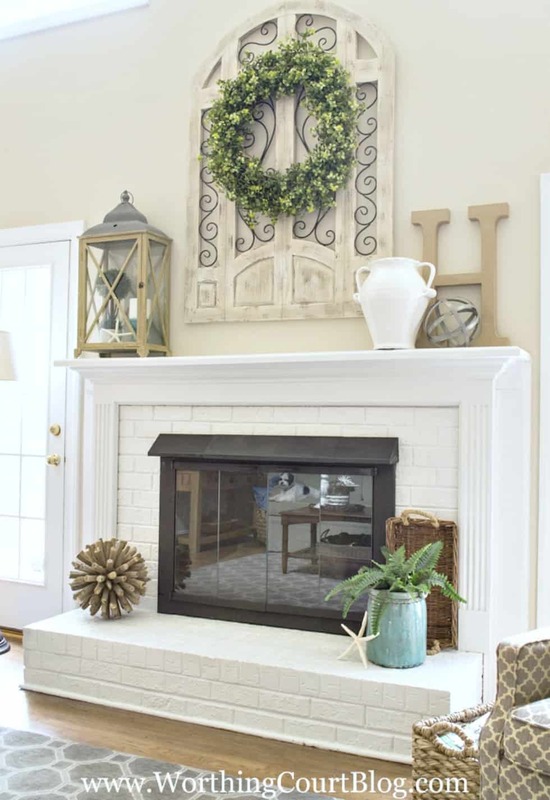 I love a good red brick fireplace as much as the next person. But our fireplace was surrounded by oak trim (as was the rest of the trim in the family room) and that had to go. It was just too dark and too dated for me. Another example of the transforming power of paint! Project #5: Reusing our old kitchen cabinets in the remodeled laundry room. 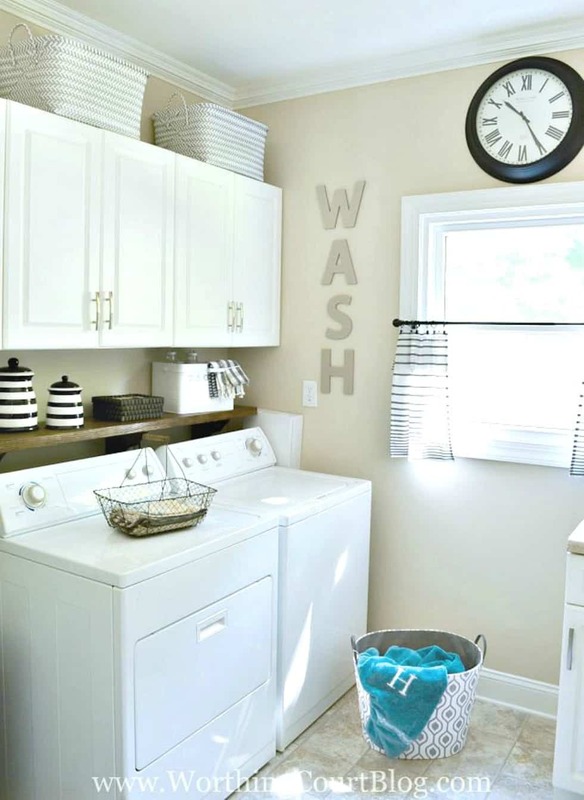 Our laundry room would not be nearly as functional and as full of storage as it is, if we had not kept some of the old cabinets from the original kitchen and reinstalled them in the laundry room. If we had purchased new, the budget would have taken a big hit and the laundry room would not be nearly as useful as it is. 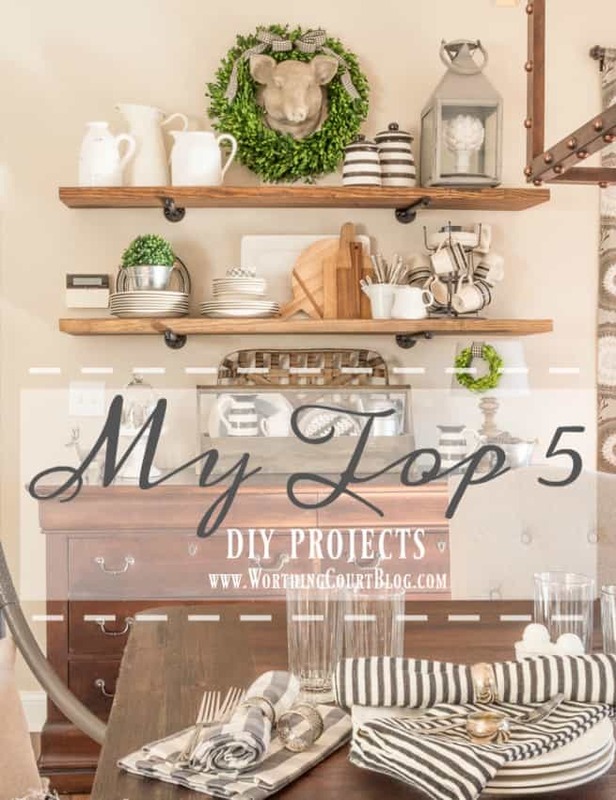 So, there you have it – the top five diy projects (to date) that I believe have had the biggest impact in the remodel and updating our our twenty year old home. Have you ever looked around your home and figured out which of your projects have made the biggest difference to you? Your house looks amazing Suzy! Very inspiring. Your house looks beautiful and I agree with you on painting the dining table. I am still waiting to do this project and will do this soon. I know that I will be happy once it is done. I also like the shelves that you did in your dining area. There always seems to be a project. Everything look amazing. 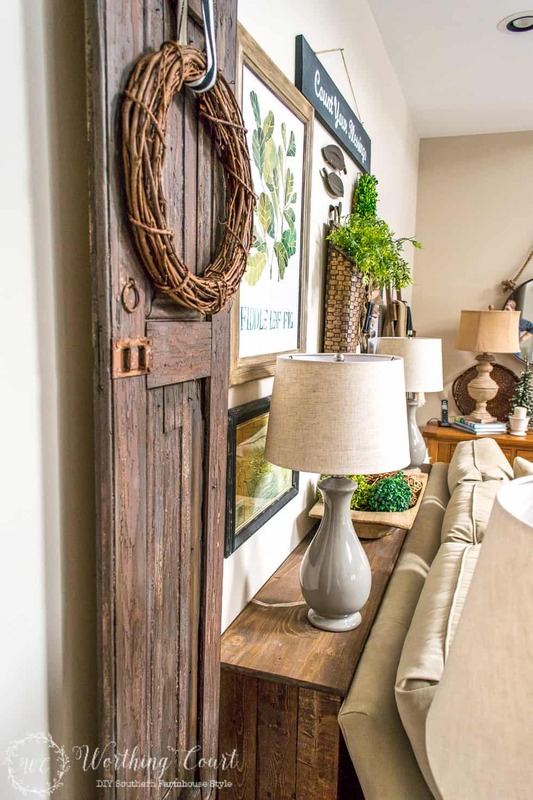 I love the way you have transformed your home into your own personal style. 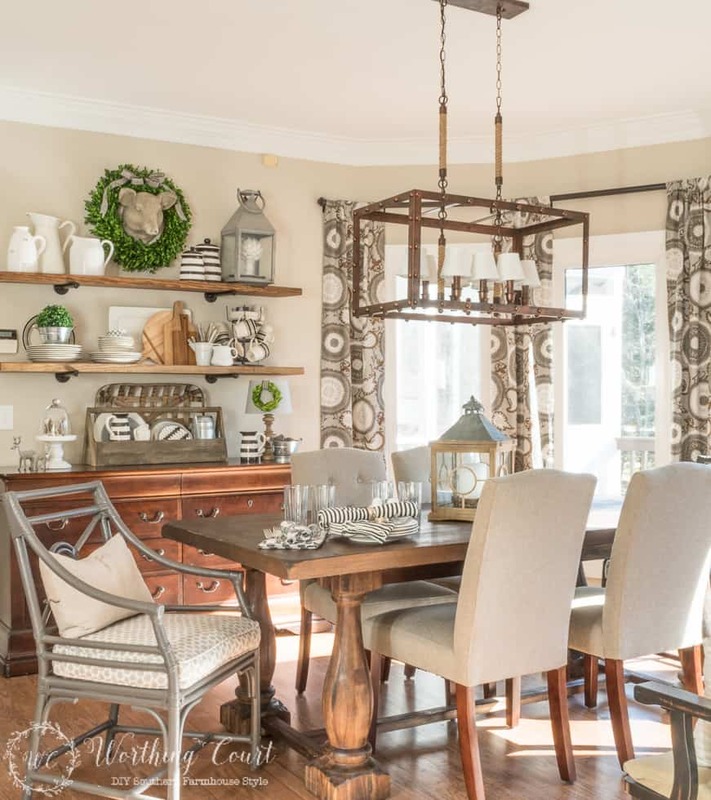 My favorite has got to be the industrial shelves in the breakfast area, although all of these improvements have made a dramatic impact!! Suzy, you have created a warm and inviting home. We installed hardwood flooring throughout our 2nd story and it has by far been the biggest yet most rewarding DIY we’ve tackled. I think every change you and your husband have made has improved your home. It’s just beautiful! Thanks so much for sharing your good ideas. I love all of the updates you have done! Your home is so pretty and welcoming! great decorating style. love the ideas and creative tips. I love all your ideas and your home transformation! Your have a beautiful home! Keep up the good work! 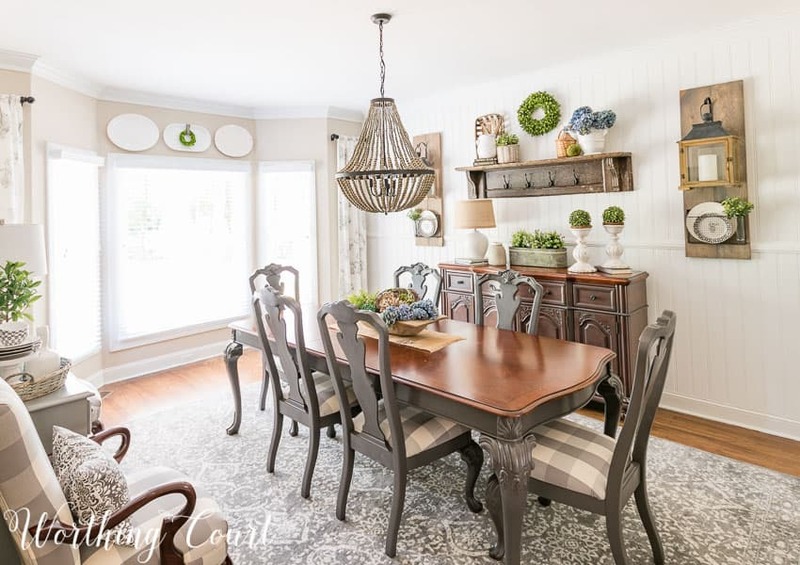 Love the painted dining room table. Awesome look!!! I so enjoy your projects!! When you need something else to decorate, my house is around the corner(s)from you on the corner of Foxhollow and Westminster!! Oh my, you have a beautiful home. I love your style and really admire your makeovers. Thank you for showing the before and afters! I have a question about your shelves in the Breakfast area. I have some that are just about like yours and I’m trying to decide how to space them above my buffet and how far apart to put them on the wall. Can you tell me the space between your shelves and the top of your sideboard to the bottom of the shelf above it? Thank you in advance and thanks for the inspiration! HI Elizabeth. The distance from the bottom of the lower shelf to the top of the buffet is 18.5″. The bottom of the top shelf is 15.5″ from the top of the middle one. And the top of the next shelf is 35″ from the ceiling (we have 9′ ceilings). Hope this helps! I too have red brick with an Oak mantle. I also have an oak china cabinet…I have been saying for a while to much oak. Not sure that white is the way for me to go, Will have to think about it. I do love the way yours looks. I love everything you have done in yor home.